116 – How To Achieve Your New Years Resolutions! Welcome to episode 116 of the Unchained Warrior Podcast. It’s great to have you here again and welcome if you are joining us for the first time. First step is to start every day with a review of your dreams and ambitions. Let your actions throughout the day match your dreams as listed in step 1 above. Next is have only people who understand or at least respect your dreams around you and get rid of anybody else. Finally, end everyday with a journal of your progress and plan for the next day. Warriors these are practical steps you can take to achieve al your new year’s resolutions in 2019! 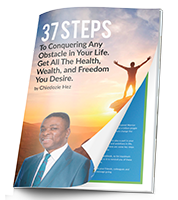 My email is Chiedozie@unchainedwarrior.com and on Twitter @Unchain_Warrior Resource Recommendations The Success Principles by Jack Canfield – Amazing book that takes you steps by step through the journey of achieving beyond your wildest dreams. Think and Grow Rich – Think and Grow Rich! is the most widely acclaimed, influential book on success ever published. Thank you for listening to today’s show. What do you think? Would you like to add anything or ask a question? Please leave your comments below, I would really like to hear from you and answer any questions you have. See you at the next show and don’t forget that you are a warrior, keep living it.